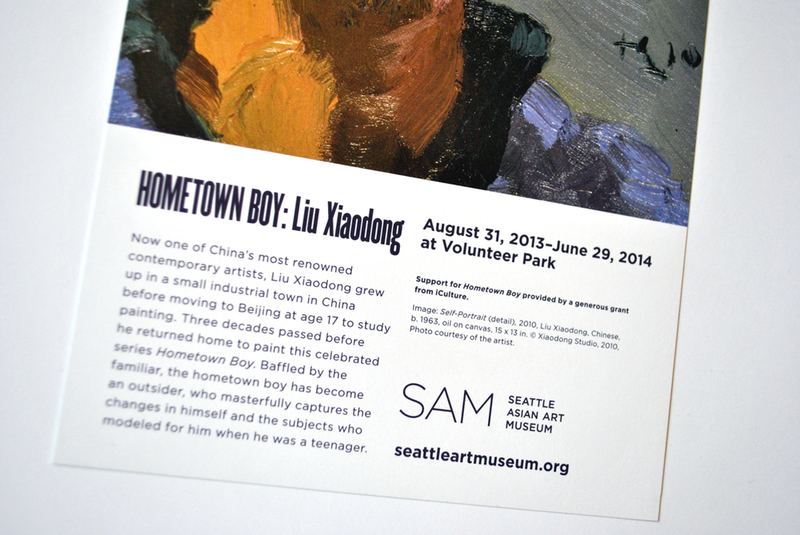 For every exhibition at the Seattle Art Museum, the creative team produced a rack card. 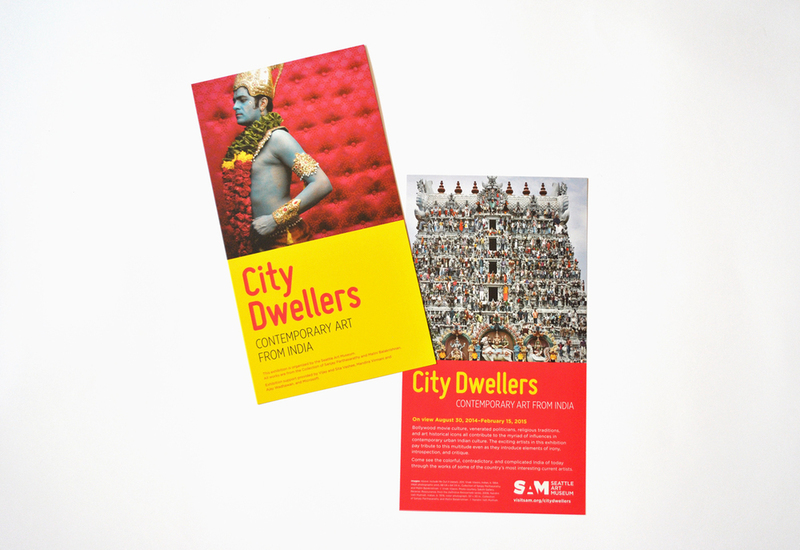 About half the size of a sheet of paper and tasked with capturing—and selling!—an entire exhibition, rack cards are something of an art form. Between images, titles, dates, and sponsors, I usually had about 150 words. I loved it. It was a fantastic challenge, and the rack card description usually became the starting block for all copy that would follow. There's nothing like a constrained word count to force creativity. Bollywood movie culture, venerated politicians, religious traditions, and art historical icons all contribute to the myriad of influences in contemporary urban Indian culture. The exciting artists in this exhibition pay tribute to this multitude even as they introduce elements of irony, introspection, and critique. Come see the colorful, contradictory, and complicated India of today through the works of some of the country's most interesting current artists. Discover the mysteries of Machu Picchu, treasures from royal tombs and archaeological wonders from one of the cradles of civilization in this spectacular exhibition which includes over 100 national treasures before seen outside of Peru. "I've had one eye on anime since the day I was born. I definitely see no point in mimicking the style of western artists. Instead, I choose my Asian, Japanese, capitalist, born-after-the-war, every-day self as my starting point. From there comes the desire to paint a 'concrete image' that also 'expresses things not seen in the frame,' 'portrays the human figure,' and 'incorporates elements from anime and manga'. I used to produce my own pieces while also working as part of the production team at Kaikai Kiki [Takashi Murakami's studio] but now i concentrate more and more on just my own work. As a result, I've been able to get deeper inside myself. ...I have to make works that fit with the times." –Japanese Neo-Pop Artist Mr.
an outsider, who masterfully captures the changes in himself and the subjects who modeled for him when he was a teenager. Celebrate SAM's 80th anniversary by exploring the legacy of our founding director, Dr. Richard Fuller, in this special exhibition. A Fuller View of China, Japan and Korea showcases works that Dr. Fuller personally collected, as well as art from his family, friends and other more recent donors. These collectors were passionate about Asian art and dedicated to creating a world-class collection for our city and region. Featuring some of SAM's best-loved works and introducing some of the museum's lesser-known masterpieces, this installation honors SAM's history and future with a look at the incredible quality and diversity of our Asian art collection. Between World War I and II, the world was changing rapidly. With the machine age came an increased emphasis on speed. The art world answered with Art Deco, which had a driving energy that found expression in graphic designs with fast lines which could be used on everything from housewares to posters, and for everything from politics to advertising. Deco Japan reveals the widespread and particular impact of Art Deco on Japanese culture. Shown in our gem-like 1933 Art Deco building, this exhibition offers you the rare opportunity to experience the full range of Deco artistry in a period setting. 10 Offering one’s lips to any man who is useful, even if he is bald or ugly, but keeping one’s chastity because “infringement of chastity” lawsuits are out of style. Meet the mystics—the four artists who, in the late 1930s and '40s, became known as the Northwest School of modern art. Fed by one another's passions and talents, Mark Tobey, Morris Graves, Kenneth Callahan, and Guy Anderson sought to create art that consciously responded to the world events around them. All saw art as a form of spiritual quest. All were influenced by the Northwest's swirling mix of Native American and Asian traditions. Soon, they were known in New York and across the country—regional artists whose visions, for a time, were universal. This summer, see these critically acclaimed American modernists at the Seattle Art Museum, which holds one of the largest and finest collections of their work.